Super Bowl Sunday is going to be more fun for cat lovers this year than ever before. In an epic showdown, Hallmark Channel’s Kitten Bowl will be challenging Animal Planet’s long established Puppy Bowl, which features a Kitten Halftime Show. 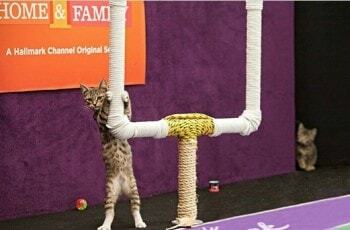 The Kitten Bowl will air on the Hallmark Channel at 12 Eastern/11 Central time. 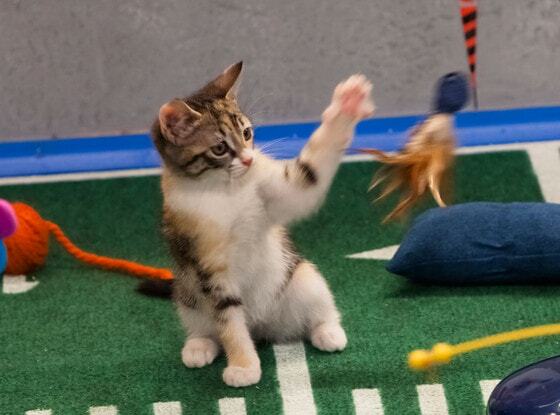 The Kitten Halftime Show will air on Animal Planet’s Puppy Bowl, which will kick off at 3pm Eastern/Pacific time. The inaugural Kitten Bowl will feature 60-70 kittens who will compete in obstacle courses of hurdles, tunnels, hoops, jumps, weave poles, lasers, lures and toys on strings. Hosted by TV personality and animal activist Beth Stern, and emceed by John Sterling, the legendary radio voice of the New York Yankees, the even will feature player profiles and “interviews,” and camera work and audio recordings from the athletes as they play the game. Not to be outdone, the Kitten Halftime Show on Animal Planet will feature appearances by Keyboard Cat and Lil Bub. Keyboard Cat will be performing the Bruno Mars song “Locked Out of Heaven,” and unlike the real Bruno Mars, he won’t need the Red Hot Chili Peppers to back him up. And there’s always hope that some of the commercials during the “real” game will feature cats – I guess we’ll just have to watch and see. If you’re a Seahawks or Broncos fan, good luck to your team. But even if you’re not a football fan, this Super Bowl Sunday, you’ll finally get to participate in what has arguably become one of America’s biggest holidays without having to fake your enthusiasm! Which one will you watch: the Kitten Bowl or the Kitten Halftime Show? Conscious Cat Sunday will return next week. Are You Ready for Some Adorable Football? 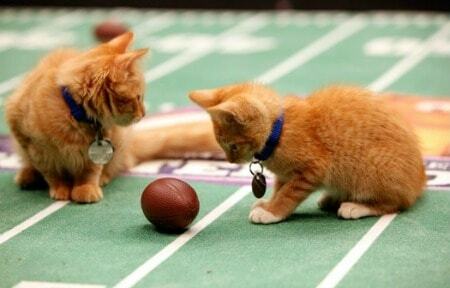 Kitten Bowl III Takes Place This Sunday! Ellie Mae and myself watched the Puppy Bowl and the kitten halftime show. We would have loved to watch the Kitten Bowl but we do not get the Hallmark Channel. Any ideas on where online there might be a place for us to stream it? We are also football fans and watched as much of the “big” game as we could stand…………it was a sad game. You can watch a bunch of videos on the Hallmark Channel website, but I haven’t seen any video of the actual “game” yet. By far the best part of Superbowl Sunday! I watched the kitten bowl and cheered for the Lions and Felines but both lost. I was on my feet the whole two hours they played though but then laid on the couch to watch the championship game and dozed off. It just wasn’t as exciting once my teams were out of it. I thought the kitten bowl was much better than the puppy bowl. Now I’m rooting for Seattle. Loved the kitten bow. Probably won’t get to other one. I think the Kitten Bowl was just about the cutest thing I ever saw. They did a really nice job with it. I missed the Kitten Halftime Show on Animal Planet, will have to catch it on YouTube. We’re watching right now…and it couldn’t be cuter! I know what I’ll be watching! Oh! That is such a fun idea!